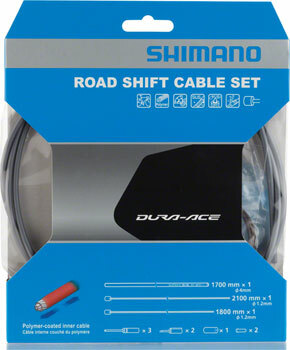 Shimano classifies this as Dura-Ace quality and it has all the same features. Cables are extruded and PTFE “slick” coated for smooth operation you have come to expect out of Dura-Ace cable sets. Road PTFE * 1700mm x 4mm housing x 1 * 2100mm x 1.2mm cable x 2 * PTFE coated extruded stainless steel cable * Factory greased SP41 housing * Cable and housing set designed to maximize performance of Shimano STI levers with internal shift cable routing.